Prosecutors in Panama have arrested the partners of a law firm involved in last year's Panama Papers scandal in which thousands of documents related to offshore accounts were leaked. The arrests are linked to corruption and bribery allegations involving Brazil's construction giant, Odebrecht. The two men, Ramon Fonseca Mora and Jurgen Mossack, were detained after two days of questioning. The Mossack Fonseca partners now face charges of money-laundering. There is information which "allegedly identifies the Panamanian firm as a criminal organisation that is dedicated to hiding assets or money from suspicious origins," said Panama's Attorney General Kenia Porcell, announcing the arrests. The pair will be held in detention because they are considered a flight risk. A defence lawyer for the two men described the evidence against them as "weak". Odebrecht - Latin America's largest construction firm - has admitted to paying $1bn in bribes to obtain in contracts in 12 different countries. In last April's "Panama Papers" leaks, more than 11 million documents from Mossack Fonseca were released. They showed how some wealthy people were using offshore firms to evade tax and avoid sanctions. 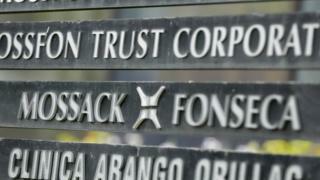 Mossack Fonseca denied wrongdoing in the case and said it was the victim of a computer hack. It also maintained that the information leaked was being misrepresented. Mr Fonseca had served as a minister in Panamanian President Juan Carlos Varela's government but stepped aside earlier in 2016 after separate allegations linked his law firm to the corruption scandal engulfing the Brazilian state oil company Petrobras.